The 2.5D trend - This Is My Joystick! Just a few days ago the trailer for the next Mortal Kombat game went online, and what it revealed was the new direction that the franchise would be taking, one which, while certainly fresh to Mortal Kombat, isn’t completely novel and may indicate a growing trend. This trend, should it prove itself true, will bring about a correlation between two types of games separated by generational gaps but linked by similar structures: derivative new games (like Shadow Complex), and the games that inspired them (like Metroid). At first glance, you could mistake the Mortal Kombat in the new trailer for the same as any of the last few games. The camera views the 3D world from the side, much like most modern fighters do, and some of the warriors whip out hidden weapons and swing wildly much like in the days of Deadly Alliance. As the trailer unfolds, it’s clear that there’s one thing missing from this new MK that makes an unmistakable difference; an entire dimension. The new Mortal Kombat will be a fighter in the mold of Street Fighter IV, which has 3D characters and environments but only a 2D plane to compete on. While revolutionary may be a strong descriptor for the change, it was certainly an unexpected move above all else. Mortal Kombat VS DC Universe received critical praise, and deservedly earned sales in the millions; despite its balancing issues, the game was fun and quickly paced, and it left players wanting to test each character to find their favorites. Is it arguable that we should have seen this modification to MK coming? Well it certainly has been given precedent by Street Fighter IV. Prior to this major release, the series had lately only seen big additions on the PSP, its console titles being technically reworked re-releases. As for Mortal Kombat, before DCU there hadn’t really been any hits coming from the franchise, as the gameplay bore such minute differences from title to title that it’d apparently grown stagnant; the MK name barely what it used to be. 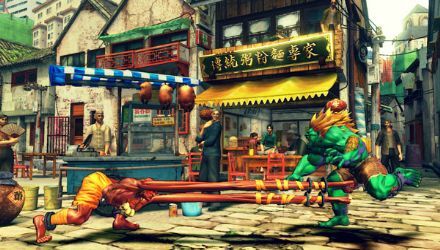 Then Capcom announced and delivered on Street Fighter IV, reinvigorating intrigue in the SF name for long time and fair-weather fans alike by eschewing a third-dimensional plane to go along with its 3D world and fighters (and thereby avoiding alienation of those who have grown used to how the franchise is). Even outside the fighting genre, franchises with roots in the 2D sprite era, both successful and not, have been returning to form this generation. Nintendo cashed in on the 2.5D concept with New Super Mario Bros. DS, which may have only come about thanks to the success of the prior Paper Mario series, and then double-dipped by re-releasing it for the Wii and adding co-op last year. Another handheld hit (at least critically) that set the stage for an upcoming 2.5D console title is Sonic Rush, Sega’s first 2.5D Sonic, which itself may have been born of the Sonic Advance Gameboy games. On the flipside of this is the fact that original titles have gone the same route. ‘Splosion Man (which many have noted for being similar in style to Sonic), Shadow Complex, LittleBigPlanet, and P.B. Winterbottom all make excellent use of the 2.5D style, drawing strong influences from legendary franchises in their respective genres. What the successes of these fresh properties indicates is that 2.5D is not only a legitimate world of game design all its own, distinguished from 2D and 3D, but it is one that can reach into either of the other two markets, as it sports the pretty 3D sheen that many younger gamers desire along with the 2D simplicity that many older gamers long for. So, this all in place, is it really hard to believe that Mortal Kombat has been so drastically altered? I don’t think so. This is exactly what Mortal Kombat needs if Midway wants to tap deeper into the multiple millions it grossed with DCU. With the old-school gameplay, fans that grew up alongside the franchise and may have lost interest can either cite nostalgia or honest curiosity as a reason to at least try out this next release; and fighter fans that take an interest in MK for its brutality and looks can note the visual style and return to gory form as a reason for testing it out. By converting the series to 2.5D, Midway has expanding the reach of the series, increasing its potential cash flow as a result. 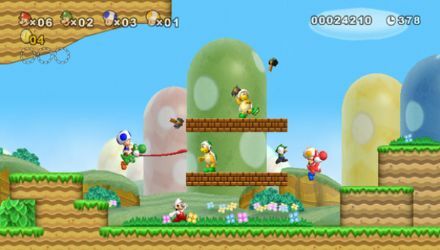 New Super Mario Bros. Wii appealed to casual gamers and old-schoolers alike with its 2D style and 3D visuals. For now, it’s impossible to know exactly how things will play out, but with the knowledge we have from recent releases, it’s easy to hypothesize. Hopefully things will turn out well for the new Mortal Kombat as well as other 2.5D revamps in the works, most notably Sonic the Hedgehog 4: Episode 1 and Metroid: Other M. Whatever does happen, we can expect that the results will shape the fate of 2D, 2.5D and 3D games to come, as there are clearly still new paths to walk.